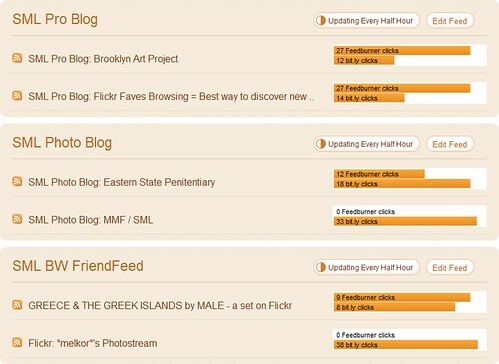 TwitterFeed (Twitter:twfeed) is a useful service which pumps RSS feeds to your Twitter account. 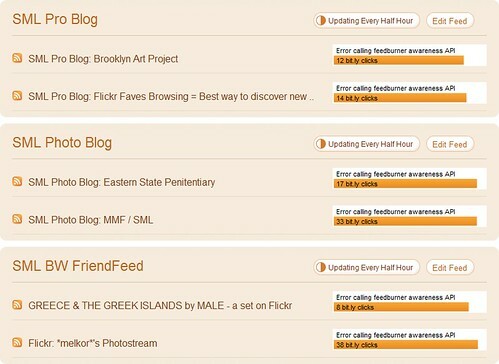 I tested out the server a couple of weeks ago because I wanted a separate feed for some more focus tweets, namely, for SML BW (Flickr Group / FriendFeed / Twitter), SML Fine Art (Flickr Group / FriendFeed / Twitter) and SML Graphic Design (Flickr Group / FriendFeed / Twitter). Another reason I'm doing this is because, oh, my friends on Twitter was complaining that I tweet too much. So now I can be tweeting without getting massive unfollows: I think that interesting things deserve to be seen and heard. There are more than enough talented people scattered around the Net that are super-talented and waiting to be discovered. So for those who don't mind the extra infos, follow @smlbw (black and white photography), @smlfineart (art), and @smlgfxdesign (graphic design) which is an accumulation of stuff I blogged as well as the super talented folks who post to the Flickr pool. Since Twitter is not inherently visual, it might be easier to follow their Friendfeeds (links above). TwitterFeed lets you connect separate Twitter Feed with different accounts, which is uber useful because that means that I don't have to create multiple accounts to do that. Additionally it allows you to use a myriad of URL-shortener services. I use bit.ly because it reports analytics data, but you can use pretty much anything available in the market. 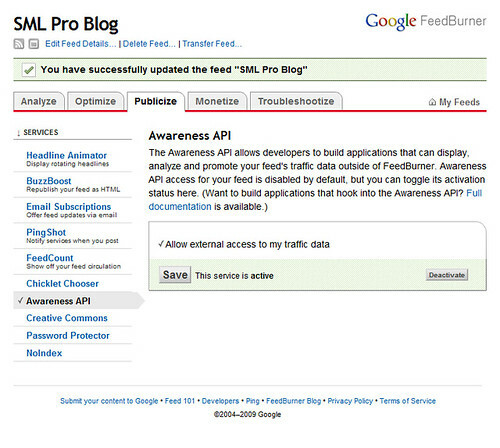 In order to get TwitterFeed to report traffic data, go to Publicize > Awareness API and activate it. After activating the FeedBurner Awareness API, TwitterFeed successfully captures click data via Feedburner vs bit.ly — which is useful if you are an uber data freak like me!